a really nice burgie man. just serviced and ready to go. Get ready for the ride of your life - on the stylish Burgman™ 650. It has a variety of technically advanced designs that give it an unrivaled combination of exciting performance and refined comfort. With the largest engine in its class, the Burgman™ 650 rewards you with strong acceleration around town or on the highway. Its refined fuel injection system offers instantaneous throttle response. And, for convenient operation and incredibly smooth performance, it has a technically advanced Suzuki Electronically Controlled Continuously Variable Transmission (SECVT™). Wherever you ride, you and your passenger will appreciate the smooth, comfortable ride, plush, responsive suspension, and a deep, well-padded seat complete with a backrest for the rider. Large floorboards and spacious ergonomics further contribute to your comfort. The Burgman™ 650 is as practical as it is stylish. It has terrific storage space, including a cavernous underseat storage area capable of holding two full-coverage helmets. What's more, three front compartments with lids allow easy storage of and access to your smaller items. The Suzuki Burgman™ 650. Unique styling - unbeatable performance. Stylish bodywork with dual multi-reflector headlights, flush-mounted front turn signals, and large combination taillight/brake designed for strength and rigidity. High-tensile steel-tube frame designed for strength and rigidity. Telescopic front fork with 41 millimeter inner tubes, provides 105 millimeter of wheel travel for sport performance and a comfortable ride. Swingarm-style rear suspension features twin preload-adjustable shock absorbers and a separate aluminum swingarm - allows optimum engine placement and forward weight distribution. Dual front disc brakes with 260 millimeter rotors and twin-piston calipers, rear disc brake with 250 millimeter rotor and twin-piston caliper - rear brake includes lever-operated parking brake system. Lightweight five-spoke aluminum wheels with radial tires - F: 3.50 x 15 with 120/70-R15 tire, R: 4.5 x 14 with 160/70-R14 tire. Front disc brake with 260 millimeter rotor and four-piston caliper, rear disc brake with 210 millimeter rotor and twin-piston caliper - rear brake includes lever-operated parking brake system. Powerful liquid-cooled, 638 cubic centimeter, DOHC, eight-valve, twin-cylinder engine - designed to produce responsive power under a wide range of riding situations. Electronic fuel injection system with 32-bit ECM, provides easy engine starts, precise throttle response, reduced fuel consumption, and low emissions. Direct-type valve actuation system and downdraft intake (similar to GSX-R models) for strong engine performance. Dual gear-driven countershaft system to reduce engine vibration. Electronically-controlled pulsed-air injection system (PAIR), helps reduce emissions. Convenient electric starting system with maintenance-free battery. Suzuki Electronically-Controlled Continuously Variable Transmission - using a handlebar control switch, the rider can choose between two fully automatic modes (power or normal), or a manual shift mode. High-efficiency liquid-cooling system includes thermostatically-controlled fan and liquid-cooled oil cooler for consistent engine temperature under all operating conditions. Attractive stainless steel exhaust system provides quiet operation and features a chrome muffler end-cap for improved appearance and high heat resistance. Automotive-style instrument display with analog tachometer, speedometer, fuel gauge, temperature gauge, plus LCD odometer/tripmeters and clock. 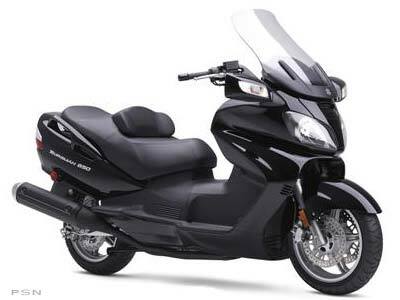 Large, illuminated 55-liter under-seat storage space - large enough for two full-face helmets. Convenient front glovebox compartment with DC-electrical accessory outlet, plus two additional storage compartments above the glovebox. Large, comfortable seat with passenger backrest and convenient lever-adjustable rider backrest. Cut-away floorboards provide more space for rider's legs when putting feet down. Tamper-resistant magnetic ignition switch cover for added security - ignition switch includes built-in seat latch operation.